Reshoots are a time-honored tradition in big budget film productions, and superhero movies are no different. Not even the genre-skewering Deadpool franchise is safe. We don't know the nature of these reshoots, but they don't exactly spell doom and gloom for the production. Pick-up footage is very common in big movies such as this, used in conjunction with the editing process to help streamline scenes. Of course, the workout in the video Brolin posted is probably much, MUCH more intense than what the actor himself did to get back to his fighting weight for the film, but far be it from us to knock him for posting it. Plus the hashtagged jab at series star Ryan Reynolds is more than warranted. Brolin got ripped for his role in Deadpool 2, as evidenced in first photos of the actor in character as well as the recently debuted trailer that finally showed off Cable in action. Pointing out the different aspects of filmmaking seems to be a recurring theme among the marketing for Deadpool 2 thus far. Not only is Brolin calling out Reynolds' CG abs, but Deadpool himself had to postpone the trailer's sizzle scenes and re-enact some shots with some action figures after a gag about the effects for Cable's metal arm not being ready. He also turns to look at the camera in his fourth wall-breaking style to call out the piss-poor writing at one point. This is not the only effects-heavy role featuring Brolin for the month of May; the actor will reprise his role as Thanos in Avengers: Infinity War, hitting theaters two weeks before the premiere of Deadpool 2. In that film, Brolin plays the large-statured supevillain Thanos in what is mostly motion-capture and voice-over work. It likely did not require the fitness regimen required for the role of Cable, and since Brolin is mostly CG in the Marvel Studios movie, reshoots would not require a return to the strict eating and exercise of Deadpool 2. It's fun to see the actors upholding the intense physical standards to portray these fan-favorite characters. Brolin in particular looks like he leaps off of the page of Marvel Comics. He might not have the gigantic pads and pouches that are typical of a Rob Liefeld comic book, but that's something we'll forgive for now. 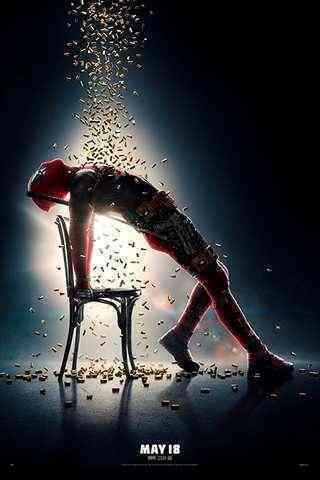 Deadpool 2 premieres in theaters on May 18th.